The Emperor’s daughter is in danger and needs your help! Face your enemies and explore the world to save your princess from a terrible curse! Use the ancestral ninja arts to fight hordes of enemies, destroy objects, avoid traps and many other dangers. 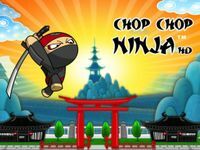 Chop Chop Ninja is a fun and intuitive platformer specifically designed for the iPhone and iPod Touch!